Message #1 Posted by Robert Love on 9 Dec 2010, 2:21 p.m.
On 24 Nov I dumped a glass of orange juice on my HP 15C calculator. I contacted the HP Calculator Care Forum asking for the address of a service center that can repair any damage since the address in the owners manual (Corvallis, OR) no longer worked. As is typical of all HP customer care these days, I have heard nothing in reply. I rinsed the calculator off immediately with water and dried the keyboard as best I could. No liquid entered the battery compartment. Questions: 1. How much damage did I likely do? 2. Will the barrier under the keypad remain in tact? 3. Where can I send the calculator for service and cleaning? 1. I hope you took the batteries out and kept them out. 2. If you look in the archives--or maybe even in the articles--you can see discussions of cleaning. One surprising idea is to immerse the whole machine--without the batteries--in clean warm water and soak thoroughly. Then, you dry thoroughly for a week, with some forced warm air. Apparently, electronics get washed all the time in the factory. You might find these discussions posted by by Randy. As Bill wrote, you should completely immerse the calculator in warm soaky water for some time and then rince with distillated water. But you hsould open the back cover before for easier drying and cleaning. I ofen soak old tube radio board before woorking on it. It is very important to let the electronic dry near a source of heat (not to hot)for several days. If you have an air compressor you could also remove the excess of water around keys spacing on the keyboard. Pay attention not to be to close as you can damage the keys with too much air pressure. i always clean my PC keyboard this way after soaking them. Good luck! I dry all of my electronics on a floor air register. If you have a forced air heating or cooling system and can leave it turned with the fan on, it creates the perfect environment to dry this stuff out from minutes to days (for your 15C). I dry all of my electronics on a floor air register. p.s. It's a good tip, I've done this too, but just once! I try to disassemble and clean and reassemble every HP I restore. It makes sure everything is clean and as free of corrosives as possible...and I can't stand dirty keyboards and dirty buttons. Most parts end up in the sink for a good scrubbing, then a good drying before reassembly. I use a big food strainer and make sure the drain has one as well... I don't want to lose any buttons! So; is OCD in the restoration of old hp calculators not a disease? This would be good news for me. Well... then I have good news! For OCD to be considered a disease, it has to be intrusive and has to disrupt your life. Being compulsive about doing a single activity right doesn't QUITE meet the definition. Now, if I spent all day worrying that I hadn't done it quite right; intrusive thoughts that I had somehow not cleaned that HP-45 well enough... then that would count. The battery compartment is the least concern of the incident. It is easily cleaned and even dried OJ is unlikely to cause conduction issues although it will make somewhat of a mess. Questions: 1. How much damage did I likely do? Likely little to none, qualified with the points below. 2. Will the barrier under the keypad remain in tact? The rubber sheet under the keyboard is a dust shield. The adhesive film bonding the snap domes during manufacture is more/less a liquid barrier. However both are perforated via the enclosure pcb mount heat stakes, which although set under heat/pressure, really don't create a liquid tight seal. Also neither rubber sheet nor adhesive film fully wrap the keyboard so it is possible for liquid seep through. An easier way for liquid to enter the switch matrix is through the pcb bottom as each dome has a large through via which serves in part as a dome vent. This invites contamination into the exact location where it can do the most damage and is most difficult to remove. This is one reason I'd strongly caution against wholesale dunking a voyager in water in an attempt to flush it out. The inside of the case can accumulate a fair collection of fine dust which can be carried into the dome vent vias by the flush attempt. If it really needed to be flushed I'd remove the enclosure bottom, vacuum off the pcb, flush cautiously while keeping anything from entering the vent vias, and vacuum off the excess flush solution before allowing to air dry. Dust will still be sitting on the upper rubber membrane so it is still possible to dislodge this into unwanted areas. 3. Where can I send the calculator for service and cleaning? The right way to clean this also the most involved as the heat stake heads must be cut and pcb removed. If contamination has entered under the domes, the adhesive film must be removed such that domes and pcb lands can be cleaned. The downside is you'll need to replace the adhesive film and recast the heat stake heads. If digging down this far I'd label the snap dome strips before pulling them out of their known configuration. Doing so you can swap/rotate them to wear level the domes. IOW swap the domes corresponding to the original enter, +, -, x, ON, etc.. keys with those of lower usage keys. After you've given it the warm soapy water treatment, you might consider rinsing or submerging it in rubbing alcohol. The alcohol evaporates much faster than water. WARNING: I haven't actually tried this. If anyone knows that this is bad idea, please correct me. leaving the display submerged in alcohol overnight can fog the surface of the clear outer protective lens. little droplets of it in tight places will not air-dry very quickly. alcohol is a great cleaner but it should not be the last thing to rinse with. That's a good point. 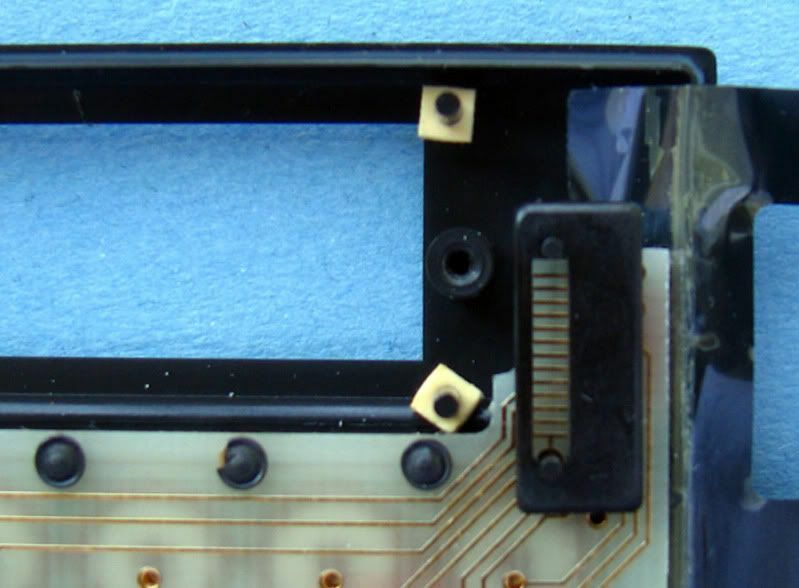 There is no seal between the LCD glass polarizer and the outer protective window. Anything seeping in between is likely to usher in loose debris and at least leave a watermark. I suppose one can always try and see what happens. But worse case is you'll need to cut the abs heat stakes and remove the pcb to gain cleaning access for anything after the 23xx s/n voyagers. The sugars from the OJ will change the resistance on all contacts and especially at minute solder points such as the ICs. Because OJ is water and fruit sugar, water is a good solvent. If some oil or oil based product was spilt then a mild solvent would be required. Washing is good, HOWEVER, if the LCD panel is clear of any debris or OJ AND it is not the older removable type then immerse the HP 15C in a bowl of water with the LCD panel above the level of the water. an example of the removable older display. Remove the back and the batteries. the LCD clear of the liquid. OJ or water to the LCD as it will leave watermarks. The drying process. Got a hair dryer with a cold air setting? 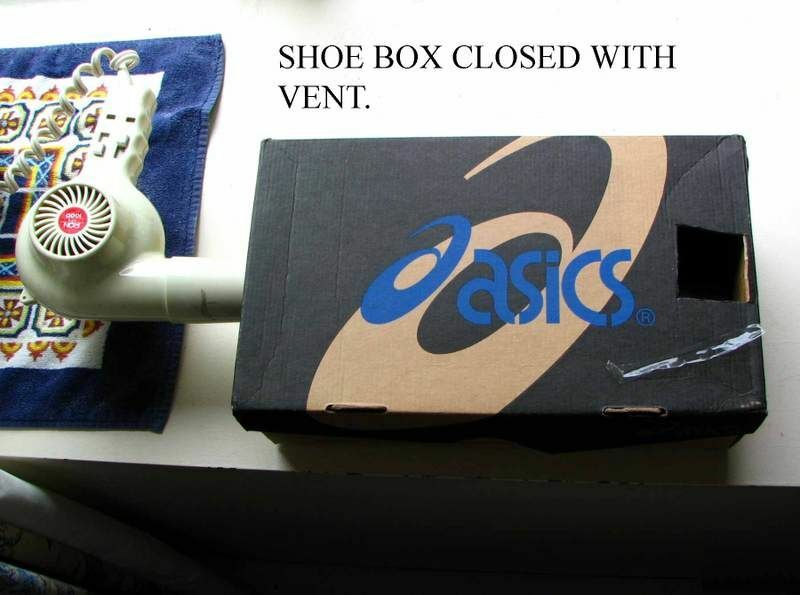 Then take a shoe box, cut a hole in one end and at the top. Insert the dryer into the lower hole as seen in the pictures below. Under no circustances should the hair dryer be set for heat. 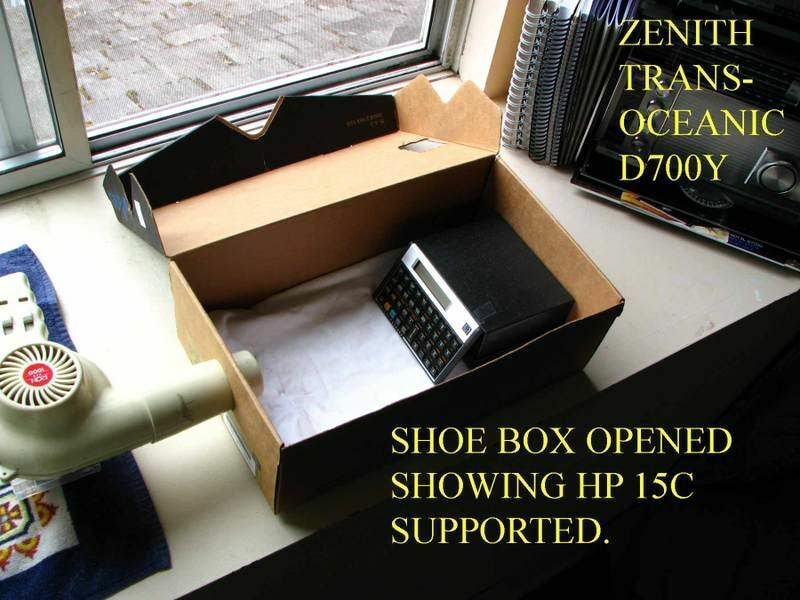 I did that and shocked myself when the HP15C LCD was pure black. After cooling it went clear and suffered no permanent damage (PURELY LUCKY). Be patient with the drying process. Re-assemble the calc and tell us how it went. Edited: 10 Dec 2010, 9:40 p.m. Unless contamination actually entered under the snap domes and the goal was to flush it out, I'd be quite leery about allowing a solution to seep into the dome matrix in any scenario. While one could plug the vias temporarily with a dab of hot glue, the dome matrix itself isn't sealed against a prospective submersion into liquid. I am assuming the worst case scenario; that the orange juice (how much for how long) has seeped in. Fortunately there are holes under each dome accessable from the back, or exposed side of the pcb once the back is removed. I have acutally introduced contact cleaner into these holes and also use these holes to blow out the contaminant, contact cleaner, water or other liquid. Interestingly (from experience), the mere fact that I can blow the liquid out of the snap dome without damaging the dome would imply that the dome is not sealed completely. I do this by placing the plastic straw that comes with a can of air over the hole in the back of the snap dome (see the lower three holes in the accompanying picture). This allows liquid contamination in, and conversly, the ability to blow the contaminant out. I have used this process on about 20 voyagers and all have benefited. Of course this is a last resort before excising the heat stakes and committing major surgery and due to major contamination. A mild wash to the face plate under a tap while keeping the LCD display free of the flow of water usually suffices. This has worked for me on minor spills but usually if the calculator buttons are not responding it can be a combination of contaminated ICs as well as the snap domes. 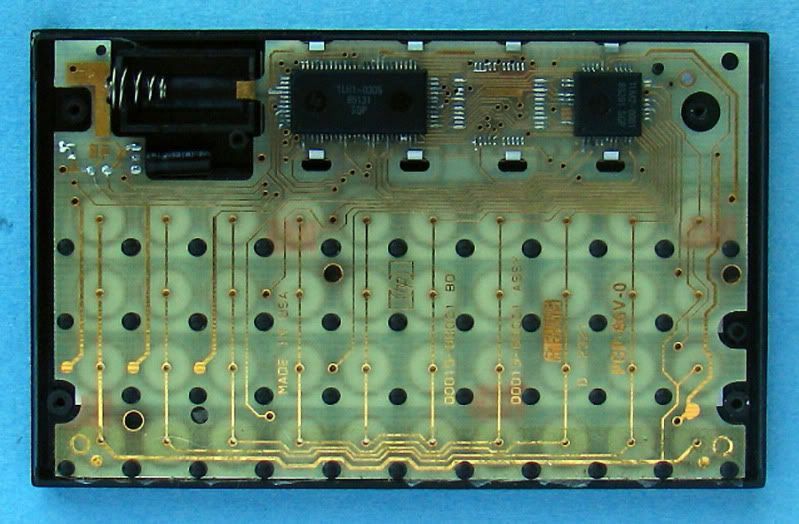 You can just see three of the holes in the pcb back sid at the bottom of this picture. Edited: 11 Dec 2010, 1:52 a.m.
the mere fact that I can blow the liquid out of the snap dome without damaging the dome would imply that the dome is not sealed completely. Not necessarily. 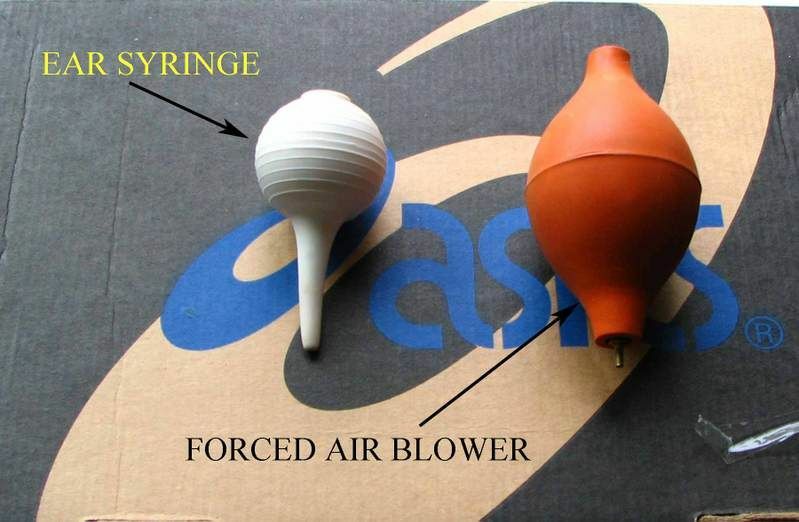 Blowing over the vent hole will reduce static air pressure there so the dome will "breath out" (think of good old velocity measuring devices in airplanes, Mr. Prandtl et al.) so debris may be transported out as well. Stopping the air flow will let the dome "breath in" again - but now only clean air since the debris is blown away already. Repeating this procedure will clean the volume under the dome to some extent. To some extent only, since the static vacuum generated is only an English vacuum, no real physical vacuum - just lower pressure. Hope this is understandable despite the obstacles of a n...l language. Could be, but when the extended nozzle of the can of air was applied directly to the hole I could swear the liquid migrated out of the snap dome via its edges. Could be mistaken though! In any case, once dried after the wash and rinse cycle the bouncy keys and non-functional keys were resurrected. Again, I would say this procedure is a last case manuever to save a calc from death by OJ. In the first image, at the extreme bottom of the photo you will see the main obstacle (other then sealed snap domes) for drying the PCB of theis 1989 15C. You can just make out the edge of a polyethelene (?) 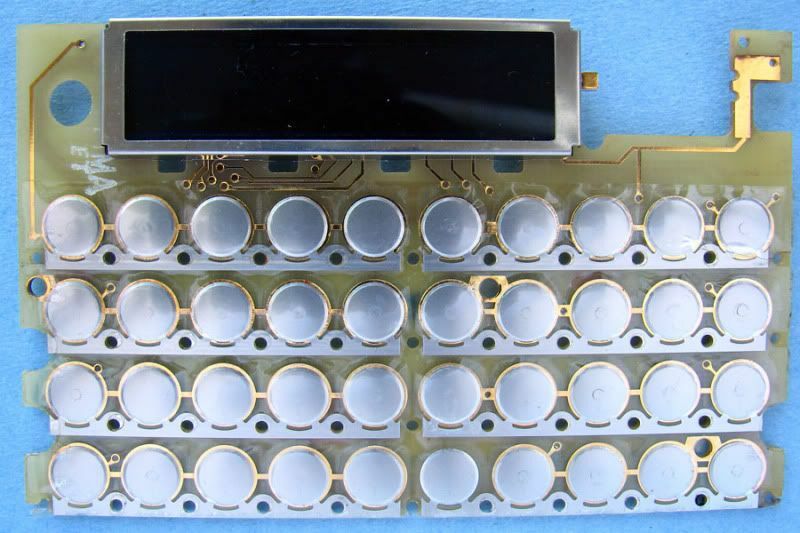 sheet which is placed over the snap domes and sealed around the edges of the PCB. Looking at the second image you can see the sheet in place and sealed. This prevents the OJ or ... from actually contacting the domes depending on its integrity. Therefore a quick rinse of the keys under a tap (LCD kept clear) would suffice on a superficial spill. When soaking the keyboard this membrane contains the liquid you are using as a solvent (water, soapy water, alcohol). When I had to treat a non functional keyboard I actually had to trim the membrane at the bottom of image one to allow the trapped water to escape from the snap dome side of the PCB. By trimming the edge of the membrane I was able to blow and shake the water to the bottom edge of the PCB and blot it up. This was discovered by trial and effort. Initially after soaking the keyboard I could not release the water from the lower snap domes and they remained squishy (technical term). That was because the liquid had collected at the bottom of the PCB and was sealed in the snap domes by the membrane. From the above experience I deduced that the snap domes were not sealed all they way around the edge and that the liquid was trapped at the bottom of the PCB by the membrane. Opening the membrane at the position indicated allowed the collected moisture to be released. 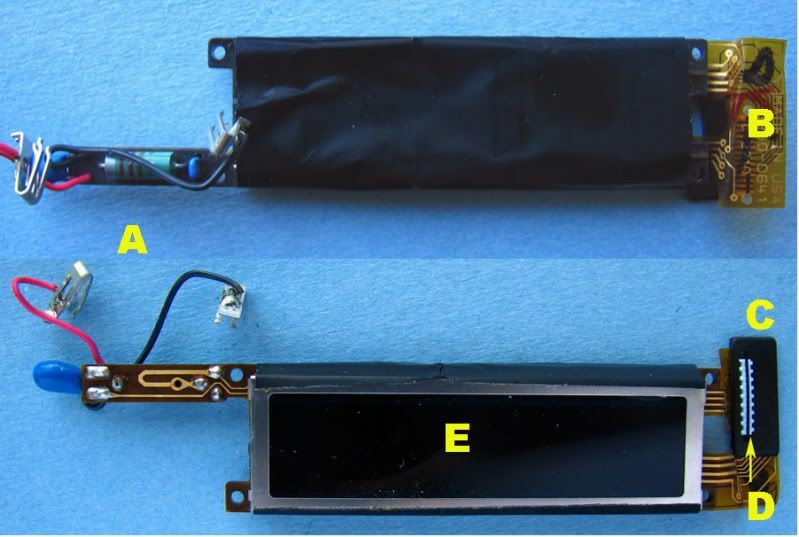 The only way to access this membrane is to remove the heat stakes as was done for the lower image. do not soak unless absolutely necessary and once done, the membrane will seal the moisture in place unless it is punctured. OF course this has the negative effect of unsealing the membrane allowing liquid contaminants to penetrate from the keyboard side. So don't spill OJ after this surgery is done! So there are two impediments to draining and drying, the snap dome design and the membrane barrier. You can just make out the edge of a polyethelene (?) sheet.. I believe it is polyester. From my observation of the housing I didn't see any seat molded into the base of each heat stake which could have created a seal against the rubber dust shield. With 42 heat stakes perforating the polyester film I sort of expected some attempt to reseal the surface. A related quirk I've found on some voyagers I suspected had worn out domes is the actuator prong of the corresponding key bottom had punctured the rubber film. This caused the key to bear on a much greater area of the dome than intended resulting in the sloppy tactile response. Ironically it seems more of a hassle to repair/replace the rubber shield than replace a single dome. I'd hazard you'd need to submerge the entire housing to introduce enough contamination into the dome vias in the pcb bottom. Which is sort of why I cringe at the thought of wholesale submerging the calc in any fluid. I'm concerned enough with having a voyager routinely sit open on the bench pcb bottom up, allowing dust to accumulate in the large vent vias, that I cover the board when I'm not working with it. But I don't mean to exaggerate the problem. It is straightforward enough to free the pcb of the heat stakes for cleaning or repair. The more disagreeable part is getting the adhesive film off the board and domes without creating a major mess. I've tried most everything including heptane, acetone, naphtha, etc.. and I haven't yet found a solvent which would soften the adhesive such that it integrally releases from the pcb and dome strips. All of the above create a mess so I just hit it with carb cleaner afterwards and mop up the resulting goo with paper towels. I usually snap off the display to avoid any ill effects of the above solvents on the polarizer adhesive and zebra strips. But I suppose you could create a jig/barrier to allow leaving the display in place. Fortunately there are holes under each dome accessable from the back, or exposed side of the pcb once the back is removed. Those are the dome vent vias. They're about 42mils and are sized to relieve dome pressure when actuated, otherwise the tactile response is impacted particularly for round domes.